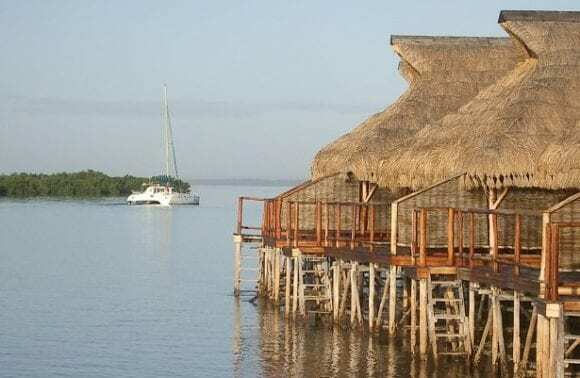 The lodge is built on stilts in the crystal clear waters of Inhambane Bay. This eco-paradise is home to flocks of flamingos, tropical fish and the very rare dugong. The sunsets at Flamingo Bay are nothing less than breathtaking. 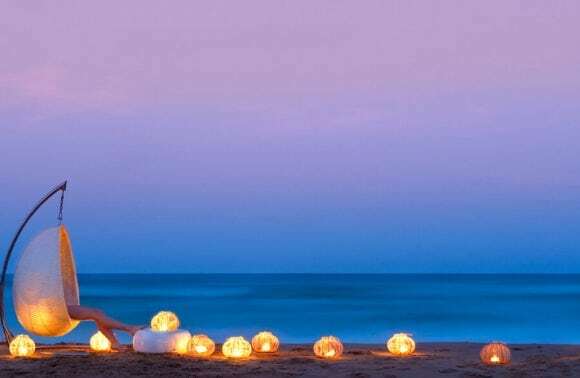 The warm Indian Ocean offers safe bathing all year round and the endless wide open beaches offer hours of strolling pleasure. The 20 luxury water chalets are spacious and well appointed with balcony, wide opening sliding doors and air-conditioning. 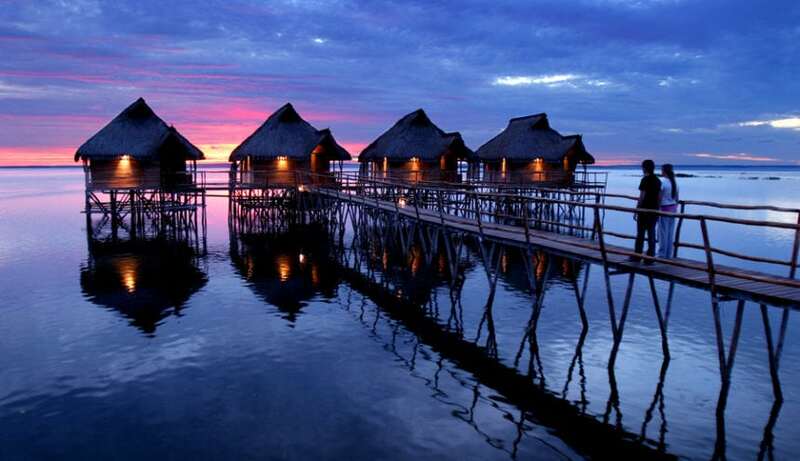 The chalets and furniture are constructed from beautiful local hardwoods from Mozambique. 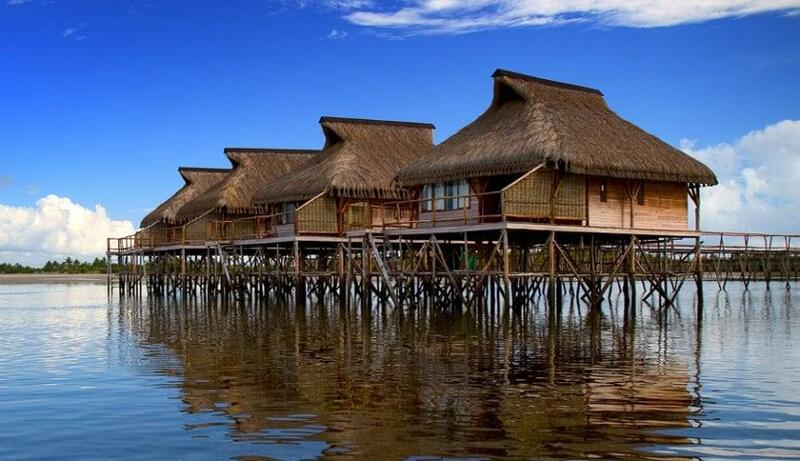 Sunbathing, swimming, snorkelling and boating may be enjoyed directly from each chalet. This lodge is unique and the only one of its kind in Africa. 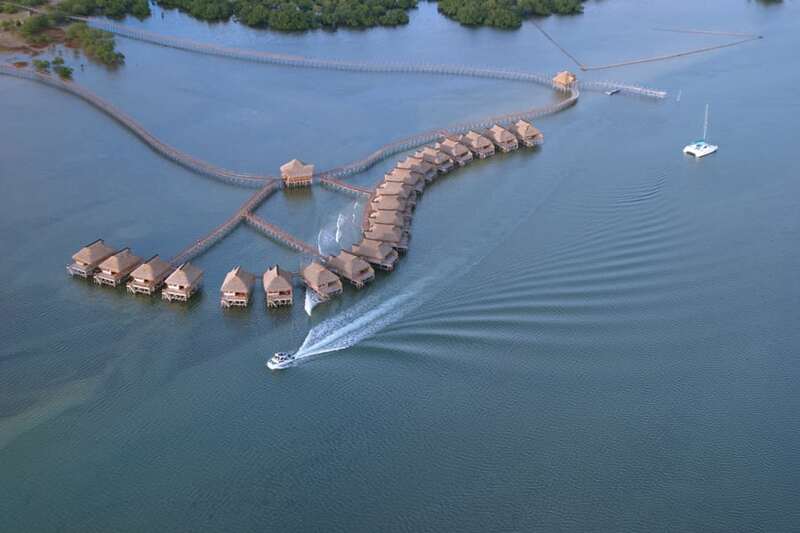 Flamingo Bay prides itself in having an undisturbed eco-setting that is peaceful and pristine. 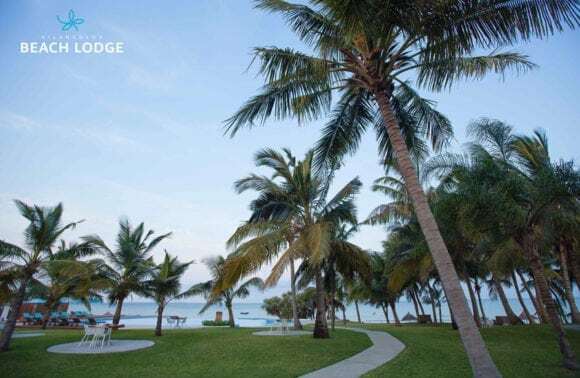 Because of the setting and exclusivity children under 12 years are not permitted at the lodge allowing guests to appreciate the peacefulness, elegance and romance of this tropical getaway. The main building and chalets are connected by wooden walkways where golf carts are available to ferry guests. The main building can also be accessed from the land and is fronted by the tidal waters of the bay. An elegant restaurant overlooks the swimming pool which merges into the view across the bay. Enjoy cocktails on the spacious pool deck while watching the sunset or enjoy your meals in the morning or evening either indoors or outdoors. 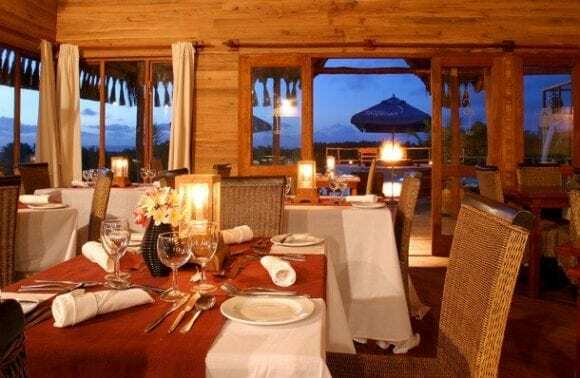 The gourmet restaurant offers sumptuous meals specialising in local dishes of Mozambique including fresh prawns, fish, crabs and calamari which are all caught locally. The well stocked bar is a gathering point attracting guests to share their days experiences and enjoy the magical sunsets. An upstairs area enhances the view as the day draws to a close. A spacious well appointed air-conditioned conference centre seats 60 guests comfortably. Please contact us for more information. Note: All activities are operated from Barra Lodge. 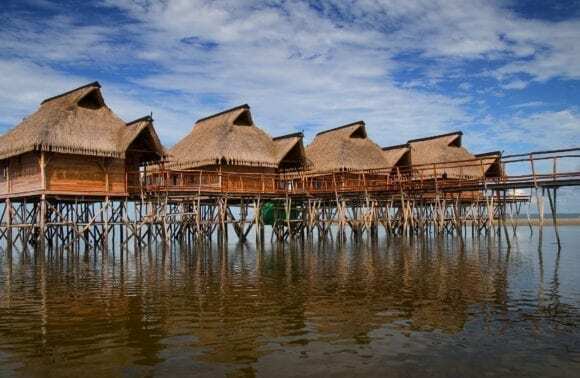 Activities at Barra Lodge include scuba-diving, snorkeling, deep-sea fishing, quad biking, catamaran sailing, horse riding and various excursions. A complimentary transfer service is available to Flamingo Bay guests wanting to participate in activities and all activities may be booked at Flamingo Bay reception. 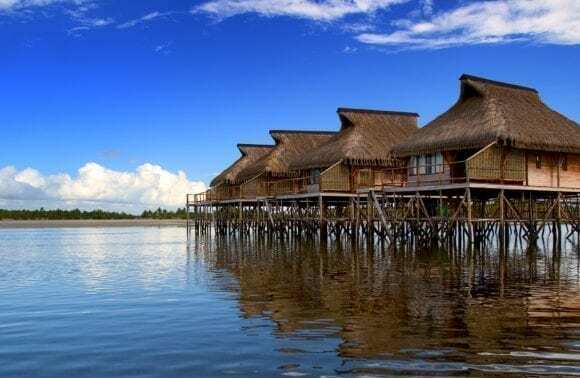 Barra Lodge has a fully equipped Padi Dive centre with all the necessary facilities including kitting-up rooms, filling station, rest areas, kit storage, lecture and first-aid areas. 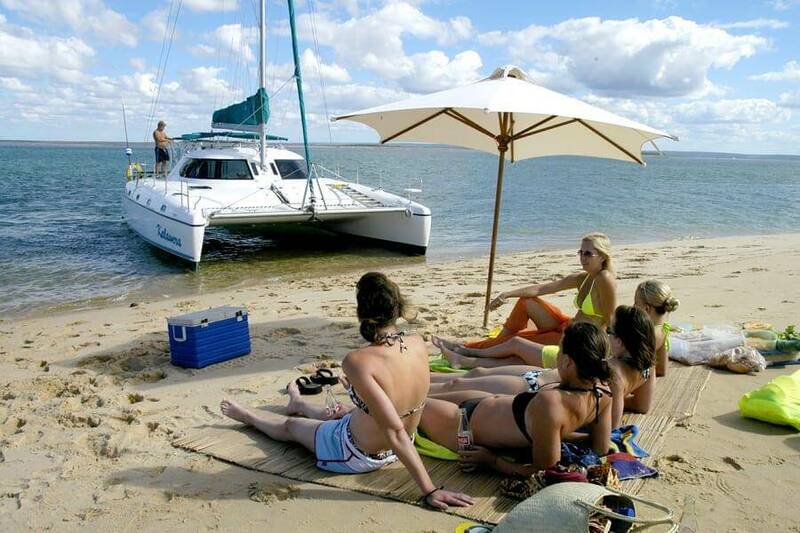 The luxury 33foot liveaboard catamaran offers unforgettable day trips in the secluded estuary. 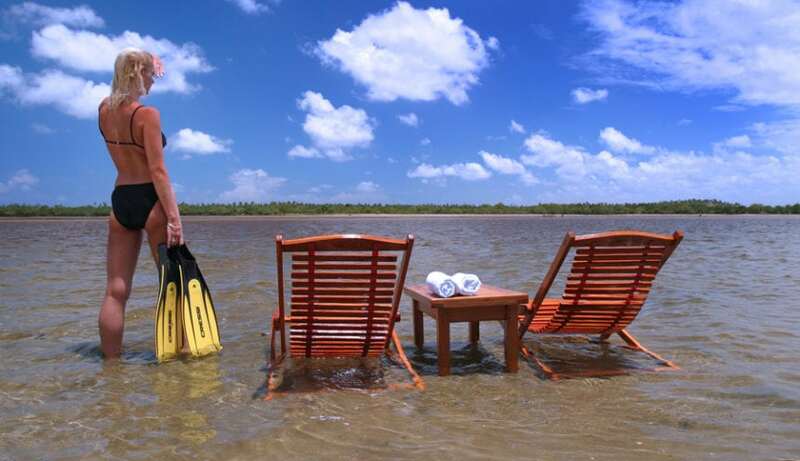 Various trips & excursions are offered as well as snorkelling and diving. Experienced resident fishermen are on hand to introduce you to these excellent fishing waters. A large number of game fish abound in these waters including sail fish and Pelagic species. This makes this area a prime destination for fishing competitions. The resort’s ski boats offer the latest equipment and tackle, and do encourage tag and release. Take a trip on a dhow and feel a great sense of history as the dhows are still built as they were in ancient times. This is something that must be experienced before this age old tradition dies out. 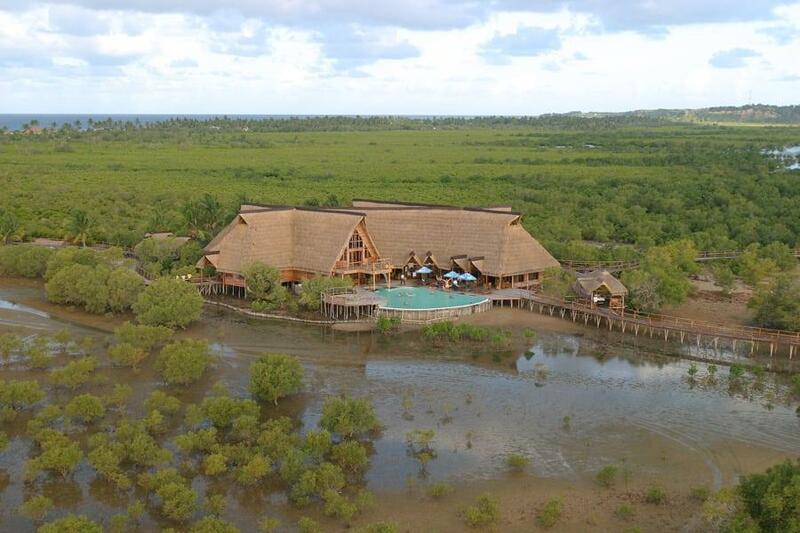 Behind Barra Lodge is a saltwater mangrove with crystal clear waters which can be explored by boat or on foot. This ecosystem is made up of a fascinating chain of pioneering and sacrificial plants together with a huge array of crustaceans. Flocks of flamingos, local fish traps and stunning sunsets over the estuary make this a photographers dream. Inhambane City is steeped in history. This was the southerly most trading port in Africa used by the Arabs. Vasco Da Gama landed here in 1534. The cathedrals, old colonial Portuguese architecture, African culture and local markets make this a fascinating town to browse around. 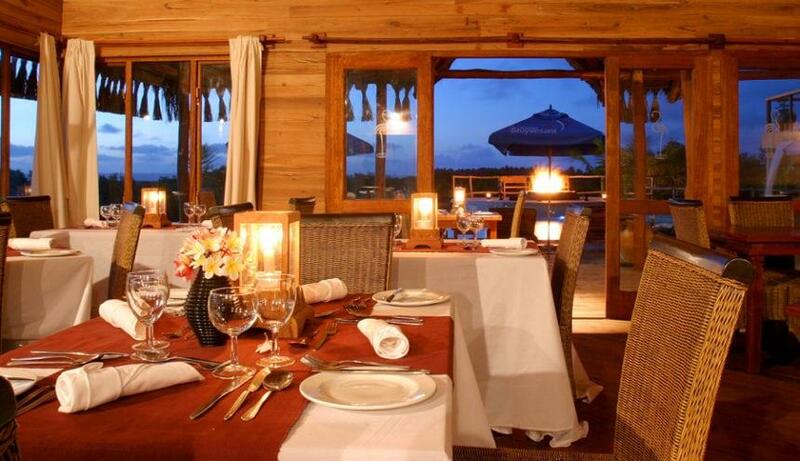 A number of restaurants in and around Inhambane offer a variety of meal options. 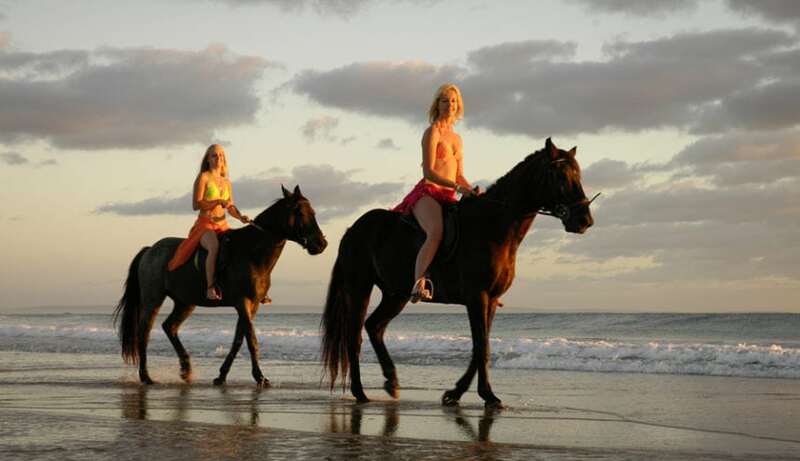 The romance of riding along the beach with the sea and sand and wind in your face is an unforgettable experience. Beginners are welcome. Quad biking through the coconut plantations opens new vistas and following the tracks and paths through these areas allows one to experience the real Mozambique while riding through local villages and into the heart of Mozambique. These are guided and managed by Barra Lodge staff. Quad bikes and vehicles are prohibited on the beaches to preserve the rich and unspoilt marine life. For water lovers a host of activities are available. The bay is ideal for hobie-cat and laser dingy sailing. Snake rides, paddle ski’s, surfboards and boogie boards are just some of the activities available. There are now daily flights from OR Tambo Airport in Johannesburg into Inhambane. 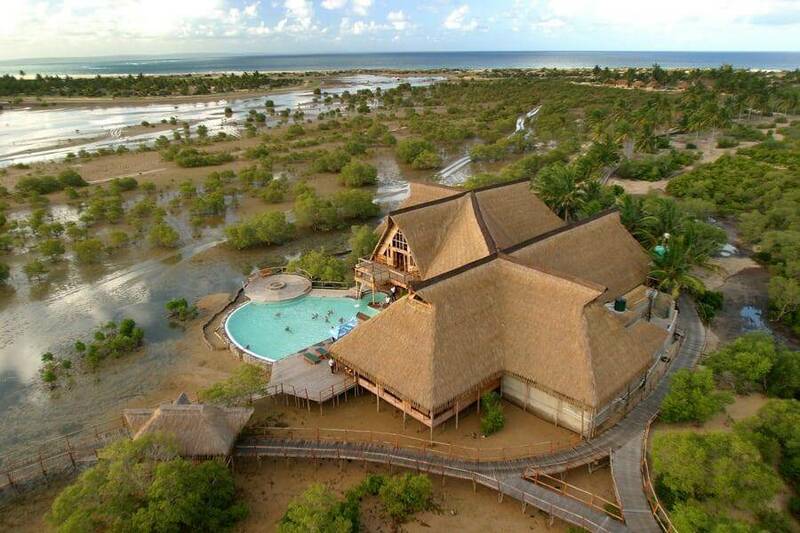 From the historical city of Inhambane it is only a 30 minute drive to Flamingo Bay and transfers are done by the lodge staff.. This scenic drive winds through local villages and groves of tropical coconut trees. Situated 485km north of Maputo, access by road is on a tarred road which is suitable for normal vehicles. The road from Maputo to Xai Xai has been upgraded and resurfaced. North of Xai-Xai there are some potholes. Be aware of construction vehicles and road crews. Please note that there are numerous towns and villages en-route and the main road often passes directly through these villages. Speed limits are enforced in these places and it is advised to drive with caution. Do not drive at night. The drive from Maputo to Inhambane can take anything between 6 – 8 hours and sufficient time needs to be allowed to avoid night driving. A secure parking area is available for guests’ vehicles. Flamingo Bay is currently closed until further notice. 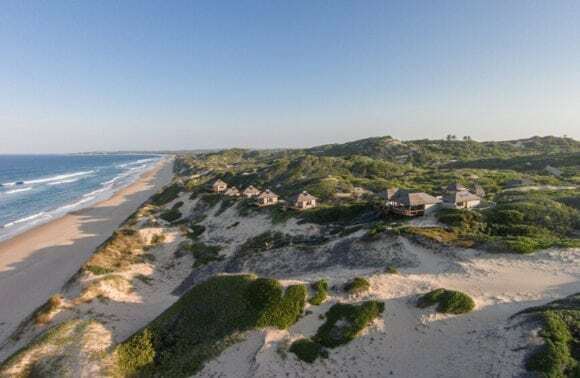 There are now daily flights from OR Tambo Airport in Johannesburg to Inhambane (some direct, some routed via Vilankulo). 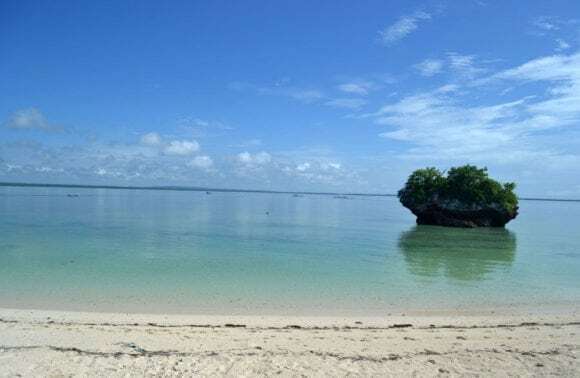 The town of Inhambane is approximately 490km north of Maputo, and the roads are mostly tarred and suitable for normal two wheel drive vehicles, for those preferring to drive. Please note that there are numerous towns and villages en-route and the main road often passes directly through these villages. Speed limits are enforced in these places and it is advised to drive with caution. Do not drive at night. The drive from Maputo to Inhambane can take anything between 6 – 8 hours and sufficient time needs to be allowed to avoid night driving. BARRA LODGE is set in a picturesque area in Mozambique, with unspoilt beaches, and is bordered by the Inhambane estuary on one side and the sea on the other. 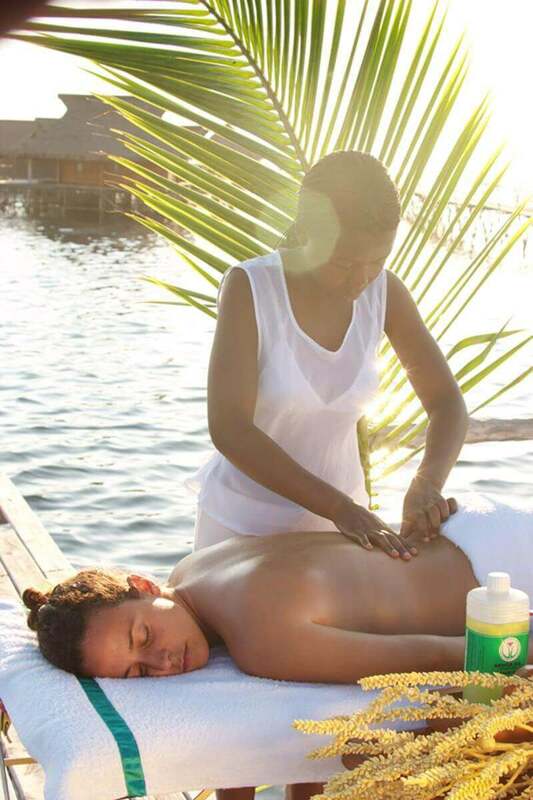 The lodge is nestled amongst groves of coconut trees and the warm Indian Ocean offers safe bathing all year round. Wide open, sun-drenched beaches offer endless hours of strolling pleasure. Barra Lodge caters for families with children and is geared towards fun and activities for the whole family. Activities include scuba-diving, snorkeling, deep-sea fishing, quad biking, catamaran sailing, horse riding and various excursions. 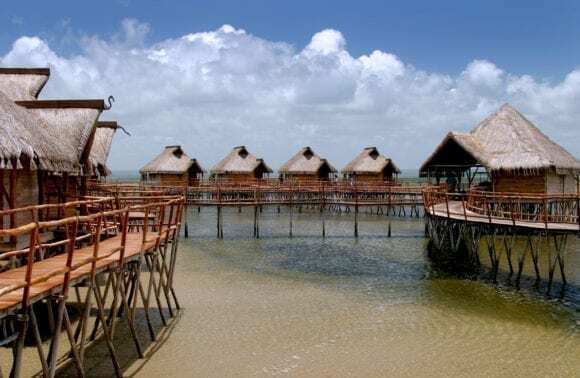 The more upmarket FLAMINGO BAY WATER LODGE is built on stilts in the crystal clear waters of Inhambane Bay. This eco-paradise is home to flocks of flamingos, tropical fish and the very rare dugong. 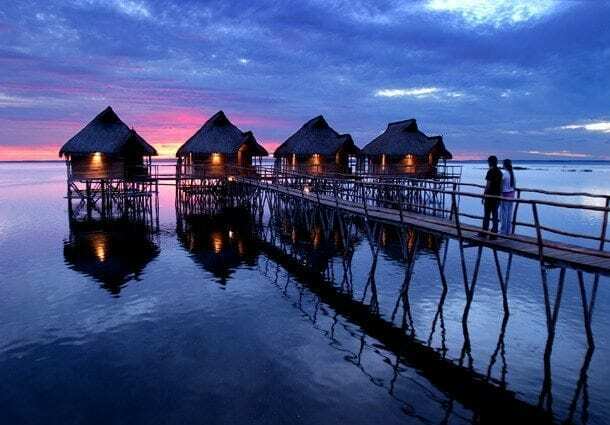 Flamingo Bay is an ideal honeymoon destination. 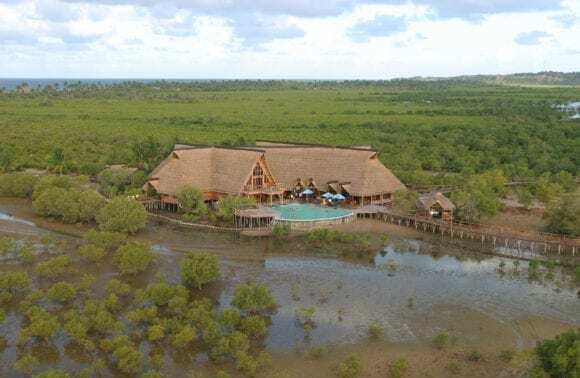 Located only 89 kilometres north of the historic city of Inhambane and with spectacular 180 degree ocean views, five-star cuisine and luxurious accommodation, lies the newly built MASSINGA BEACH LODGE. Flamingo bay was awesome!!! We really enjoyed our stay there! Great people and excellent service. We fell in love with Mozambique and will defiantly go again! “Yes, great!!!!!!!!! 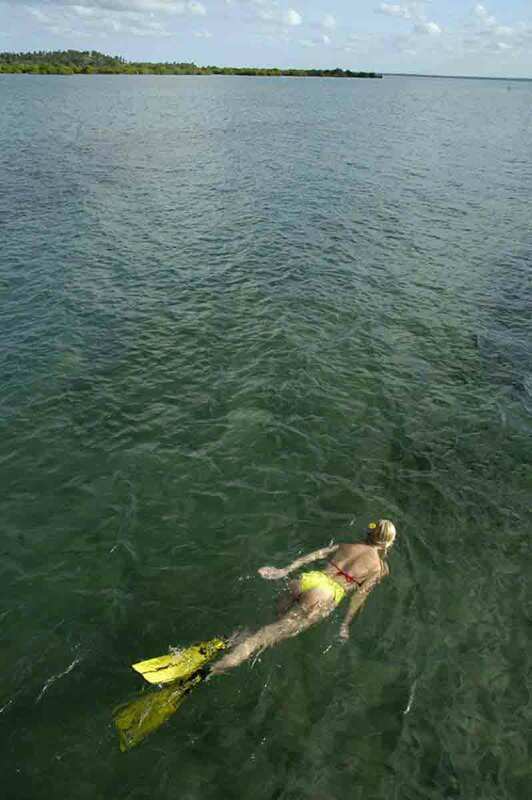 Swam with whale sharks and giant rays…..
“They loved it! Was very hot, but that was fine. Airport was quite an experience I believe! They were glad of the age limit restrictions at Flamingo Bay. 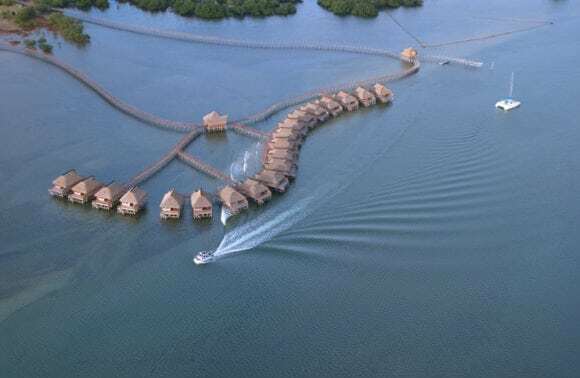 “Flamingo Bay was fantastic. We had a very nice time. We did the horse riding and quad bikes which was lots of fun. The food was also excellent. However by the Thursday we were a bit bored and wanted to go home. (Because we were bored we now have a Honeymoon Baby on the way….Hehehehe!!!!) So a week stay there is more then enough. I want to thank you for making all the arrangements. It was wonderful and we will definitely go again. Maybe for 3 or 4 days there and then to somewhere else. “It was the best holiday we had in years ! Excellent and friendly service and we will definitely visit Flamingo Bay again ! An experience we will treasure forever !! “Lodge was a great choice and would definitely recommend. They really do treat you well there. Should probably have stayed an extra 2 nights though and just for your info..they do not take Amex. LAM delays on the way out and on the way back. Perhaps that is the way things work in Africa. Weather was a little on the hot side and got eaten by bugs, but I can accept that. All in all, an excellent choice for honeymoon.